The All Nepal Peasant Federation(ANPFa), member of La Via Campesina and among the largest peasant organisations in the Nepal, hosted a South Asian Consultation on the proposed UN Declaration to protect the Rights of Peasants and Other people Working in Rural Areas. The two days long consultation also witnessed participation from peasant organisation representatives in Pakistan, Bangladesh, Sri Lanka and India. Allies from Focus on the Global South and several prominent members of the ruling coalition in Nepal also attended the meeting and elaborated on the Twenty Eight Articles that constitute this Declaration. They reflected on the role played by peasant organisations worldwide in creating a bottom-up process to develop such an instrument of justice. The negotiations on the Declaration is now at a crucial moment within the UN Human Rights Council, with the draft text expected to be tabled for voting in September 2018. The Nepal government representatives, who took the stage during the first day of the consultation, have pledged their unflinching commitment to support this process within the Human Rights Council. We, the representatives of peasants, family farmers, women farmers , dalit peasants, landless and poor, rural women and rural youth, fishers and fisher folks, agricultural labourers and tenant farmers, indigenous peoples, food consumers, water users, and forest users from South Asia – who are members of the La Via Campesina, allies and friends of ANPFa including Government of Nepal, Minister for agriculture development, Member of Parliaments and other representative dignitaries, and Nepal human rights commission met in Kathmandu, Nepal to take our struggle forward for food sovereignty and to realize the UN Declaration on the Rights of Peasants and Other People Working in Rural Areas. We the peasants from South Asia, women and men, experienced and young alike, reiterate our rights on land, water and territories; right against all forms of discrimination; rights on seeds and livestock (including dairy and fisheries); right to fight agribusinesses, transnational organizations, free trade agreements and WTO; pledge to save Mother earth from climate change hazards and most importantly our commitment for achieving food sovereignty. We declare our solidarity to peasants all around the world as we direct our efforts to a fair and equal society recognizing peasants and communities serving humanity and our planet. We consider Food Sovereignty and Agroecology as fundamental principles, and as alternative methods to cooling down the planet. We consider them as the only way of changing the current model imposed by agribusinesses and transnational companies. We reject neoliberal, patriarchal, and capitalist models that run counter to nature’s harmony and its relationship to human beings. We reiterate that peasant and indigenous agriculture is the only way of feeding humanity in a way that is healthy, sustainable, and that safeguards nature, environment, biodiversity and identities. We believe that the present threats to the peasant communities are higher than ever. The governments are aligning themselves more and more with the imperialists, neo-liberalists and International Financial Institutions at the cost of age long good practices of peasants and rural people’s livelihood. We demand the government to design policies suitable to our needs. Through this declaration, we ask the States to support the United Nations declaration on Peasants Rights which La Via Campesina has been fighting to achieve along with peasants and farmers organizations across the globe. We demand that our governments uphold and ensure genuine agrarian reforms including the right to food and adequate nutrition, freedom from hunger, right to represent state mechanism for making constitution and law rights to an adequate standard of living for ourselves and our family through support and vote in favour of the United Nations Declaration on Rights of Peasants and other People Working in Rural Areas. We acknowledge the right to equality of peasant women: equal rights and access to land, protection from all forms of violence, exploitation and discrimination, decision making, equal wages, health care, sexual and reproductive rights. We stress on the need of a collective struggle against patriarchy. We reiterate our Right to Seed Sovereignty, water sovereignty, absolute freedom from GMOs, HYVs, and other green revolution farming techniques which are detrimental to our food systems. We emphasize on our ‘right to reject’ and ‘right to choose and to be protected’. We want no interference with our traditional knowledge on seed preservation, and free exchange of seeds within farming community. We lay emphasis on the Rights of Indigenous Peoples and Pastoral communities including their right to self determination, right to autonomy or self government in their local affairs, right not to be forcibly evicted from their lands and territories. We have been constructively engaging in this process of the UN Declaration on the rights of peasants and other people working in rural areas, from the field, our workplaces around the world. We the peasants understand the current challenges facing the world’s food systems, and we continue to contribute to solve these challenges in a valuable manner. After seventeen years of hard work, sincere efforts and dedicated deliberations, throughout the world, the process towards an International Instrument has made our movement and struggle growing stronger than ever. We have intensely been feeling the legal gaps with regard to the protection of peasants’ and other people working in rural areas right across the globe, leading us to stress at the international human rights level, come forward and fill this gap without further delay. This is our Declaration, elaborated from the grassroots, cherishing so long and will keep defending it before the Human Rights Council of United Nations and before our national governments until its successful conclusion in this year 2018. All peasants and other people working in rural areas around the world strongly identify themselves with the contents of this Declaration, which will be an instrument to restore and dignify our status in society, to recognize and protect our rights, and to guarantee conflict resolution with dialogue and in peaceful manner. We are confident that the States will be readily willing to recognize the crucial rights of their respective rural populations. This is not only valuable for us individually and collectively – but also for all humanity, and it is in the interests of public and nature as well. 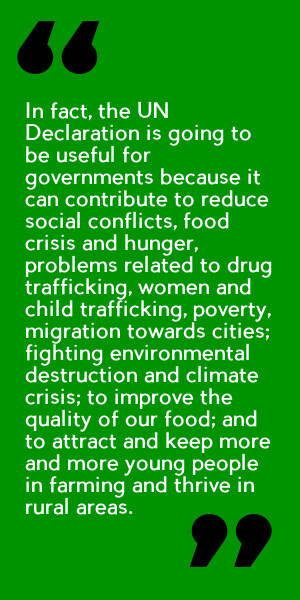 In fact, the Declaration is going to be useful for governments because it can contribute to reduce social conflicts, food crisis and hunger, problems related to drug trafficking, women and child trafficking, poverty, migration towards cities; fighting environmental destruction and climate crisis; to improve the quality of our food; and to attract and keep more and more young people in farming and thrive in rural areas. As we all stand here, in full knowledge that human rights prevail over profit and economic interests, as well as the alarming violations of the rights of peasants that occur systematically throughout the world, we thank all those States who have willingly supported it already and call upon remaining States to unite in order to recognize and further guarantee the realization of the rights of peasants and other people working in rural areas. States can no longer postpone the Declaration. The time is ripe for the recognition and protection of our rights. Let us work to finalize this process and adopt this Declaration this year. After all, Peasants Rights strengthen not only agriculturists but States and entire population along with Mother Earth!